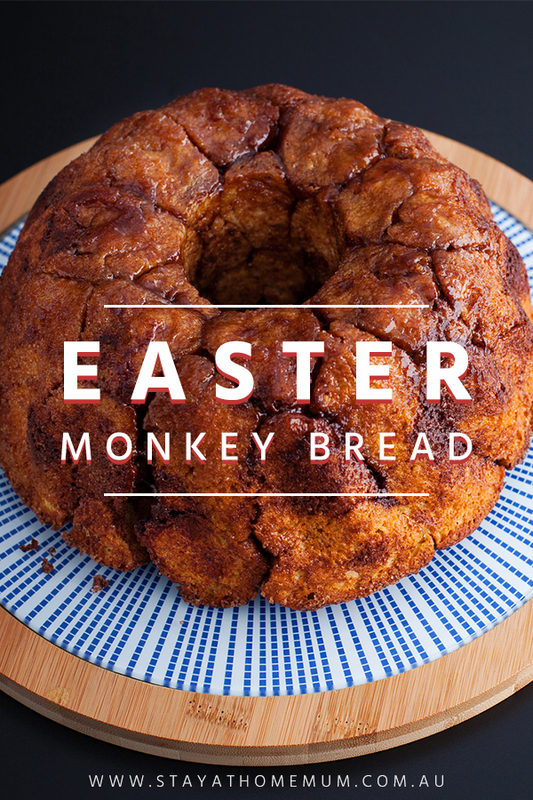 Easter Monkey Bread is time-consuming to make but, I promise you – on my Easter Egg stash – it will be worth the effort. Who is up for a challenge? I always make mine in loaf tins so I get two for my efforts. Warning: this gooey hot-cross-bun-like treat is addictive!!! Once you pop that first ball in your mouth – you won’t be able to stop! Make the dough first. Heat the milk in a pan until steaming. Remove from the heat, and drop in the butter. After a couple of mins, beat in the egg and half the orange zest. The liquid should be just warm for step 2. Mix the strong flour, yeast, 1 tsp salt and the sugar in a large bowl, then tip in the liquid and stir to make a soft dough without dry patches. Flour the work surface and your hands, then knead the dough for 5-10 mins until smooth and elastic. Use a stand mixer or processor if you like. Oil a large bowl, sit the dough inside it, then cover with oiled cling film. Rise in a warm place for about 1 hr or until doubled in size. Put the raisins and the orange juice in a small pan or covered bowl, and either simmer for a few mins or microwave on High for 1 min until hot. Cool completely. Break the chocolate into a food processor with the cinnamon and 2 tbsp sugar, then pulse until very finely chopped. Mix in the rest of the zest. If you don’t have a processor, chop it by hand or grate it, then mix with the other ingredients. Turn the risen dough onto a floured surface and press it out to a large rectangle, a little bigger than A4 paper. Scatter it evenly with the chocolate mix and the raisins, which should have absorbed all of the juice (drain them if not). Roll the dough up around the filling, then knead it well for a few mins until the chocolate and fruit are evenly spread. Some raisins and chocolate will try to escape, but keep kneading them back in. Let the dough rise in a warm spot until doubled in size. Melt about a cup of butter until all melted over a low heat or microwave. Pour into a bowl. Prepare tins by greasing with a little butter or line with grease proof paper. You could use 2 loaf tins, or 1 big Bundt tin. In another bowl, mix together about a cup of brown sugar or Rapadura and 2-3 teaspoons of ground cinnamon. Pinch off small pieces of dough, roll them into balls, and roll them in the melted butter. Then in the cinnamon-brown sugar mixture. Place the balls into the prepared tins, using smaller balls to fill in spaces. Drizzle with any remaining butter, then let them rise until they're nearly at the top of the tin. Place in a cold oven (to allow the bread to rise further as oven warms) and turn it on to 180C, and cook for about 30 minutes (depending on how big the tins are you're using). They should be nicely browned when done. Let them cool for about 5 minutes, then tip them out, upside down, onto a plate and serve with custard and ice cream or just by themselves. You can leave the sugar out of the bread recipe to reduce the sugar amount if desired. 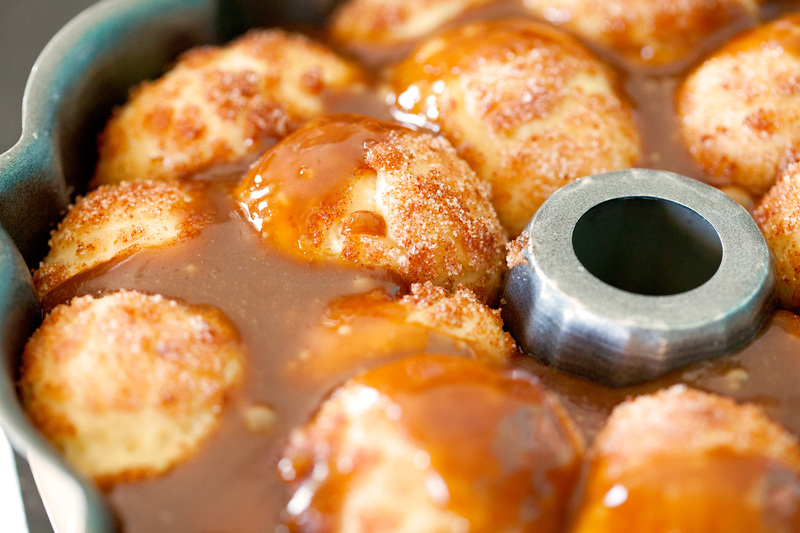 ***This recipe is inspired by Quirky Cooking's Hot Cross Bun Monkey Bread.